At a recent Local History meeting I attended, Air Raid Shelters were mentioned. It started me thinking about my experiences in using these places of refuge. I was only four years old when World War II broke out and ten years old when it finished, so a good sized chunk of my childhood was spent under the spectre of war. When I was only 6 or 7 years old (1941 or 1942) I had my tonsils removed at the Royal Alexander Children's Hospital in Dyke Road. 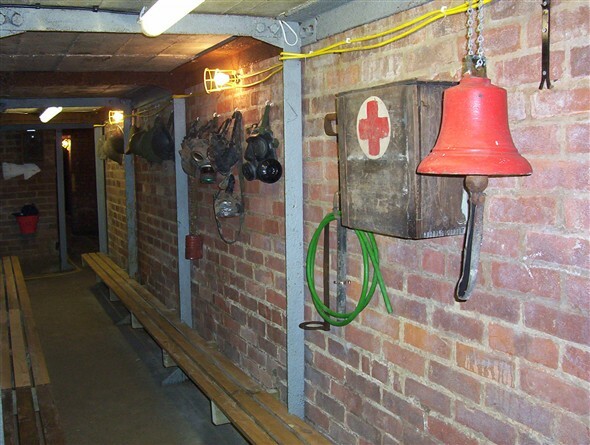 This being wartime, at night we were wheeled in our beds down a long slope to the shelters beneath the building. This probably happened during daytime raids also. We had to have our identity numbers on us at all times, so my mum had a disk engraved containing this information and attached it to a little silver bracelet which I still have. The number was EGNK 257/3. At home we did not have a garden but we did have a basement beneath the house. This was shored up from floor to ceiling by large pillar like logs. This was our air raid shelter. We had a large iron bedstead down there, no mattress but plenty of blankets for sitting on and for keeping us warm during air raids. We also stored some of our provisions down there, the cellar having a solid concrete floor was excellent for keeping fresh food cool. Mum's meat safe was down there as well as a galvanised buckets of isinglass in which eggs were kept fresh. The eggs were brought back from my Gran and Aunts who kept chickens. They lived in a country village and my Uncles shot rabbits so we sometimes had these for the cooking pot. I used to take the skins down to Richardson's, the local Rag and Bone Merchants, for which I received 3d or 6d. Occasionally we had a chicken. My infant school in Richmond Street (built 1873 - demolished around 1957) was for 4 to 7 year olds and I attended there 1939 to 1942. The shelters were beneath the tarmac playground. To reach them we had to descend a flight of steps from the building, then across an open playground to reach the steps that led down into the shelter. Very often this could not be done because after the warning there was not always enough time to get the whole school of small children across this open space. There were "dogfights" overhead and enemy pilots' machine gunned anything that moved. Instead we sat in the school corridor, arms and legs crossed, and were told to sing very loudly, presumably to shut out the noise outside. I lived over the road from the school in Ashton Street next to the Ebenezer Chapel, were during one raid all our windows were blown out. The school was just yards away from the School Clinic in Ivory place, which during one bombing raid in March 1943 received a direct hit that resulted in fatalities, there were 3 children killed and 3 pregnant mothers injured. I then "moved up" to Finsbury Road Junior School for 7 to 11 year olds, which was built in 1881, and was there from 1942 to 1946. Our shelters were situated in the road at the kerbside. They were brick built with corrugated iron roofs, resembling small Nissan Huts. I don't know what protection they would have given us but at least we were out of the building. To gain fast access to these shelters a doorway was built in each classroom outside wall. The door was locked but the teacher had the key and would open the door when the siren sounded. There was a deep drop, rather like a dry moat, between the building and the outer wall, so a bridge was built across to another doorway built into the outer wall which led out onto the pavement and into the shelter, one for each classroom. When St. Luke's School was damaged during a raid we shared our school with them. We attended mornings on one week and afternoons the next and vice versa for St Luke's children. Incidentally, when the school (by then a "listed" building) was being converted into flats a few years ago, I went to the Site Manager and told him I had been a pupil there during the war. He showed me around the Show Flat. One classroom is now a 2 bedroom flat! The tall windows and high ceiling gave room for a mezzanine floor to be installed. The ground floor is "open plan" with the original open fireplace in one corner. A curving staircase leads upstairs leads to the upper floor where there are 2 bedrooms and bathroom facilities overlooking the ground floor area giving a balcony effect - amazing! If walls could talk what stories they would tell of classroom incidents. In September 1946 I went to Varndean which was then a Girls Grammar School. It was built in 1926 and went "comprehensive" in 1975. I left there in 1951 at the age of 16. The war in Europe having ended in May 1945 and in the Far East in August 1945 meant that I did not have to use the shelters there. I believe they were underground but I can't be sure. A memorable activity I have from those days was making "Pom-poms" using coloured wool and cardboard milk bottle tops. They had a variety of uses from decorating hats, gloves, cots, prams, or even for the cat to play with. How I would like a shilling for every one of those "Pom-poms" that I made. Another activity was covering those same type cardboard milk bottle tops with raffia then sewing them together to make table mats or even shopping baskets. 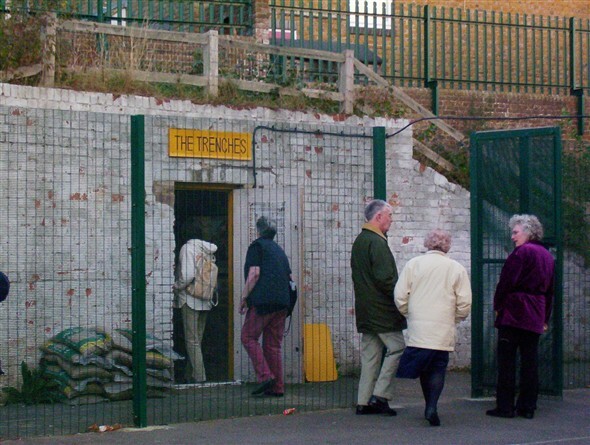 Whithawk Primary School shelter known as "The Trenches"
TheTrenches are open to the public by prior booking. This page was added on 01/07/2009.